Trench warfare was a prominent feature on WWI battlefields. One of the most famous trench battles midway through the war was the 1916 Battle of the Somme, an Allied offensive attack against German forces along a 30-mile stretch, where Allied forces faced a no man’s land of interconnected trenches, artillery, wire entanglements and land mines. Trench warfare changed the battlefield like no other war in history. Create a diorama to understand how WWI trench warfare formed a static battlefield that might have ended in stalemate, if not for Allied tenacity and American intervention toward the end of the war. Decide what scale you will use. Diorama modelers typically use 1/35 scale, or in other words, one-inch in the diorama equals 35-inches in real life. Any models, soldiers, or greenery you decide to use must be to scale, otherwise you sacrifice realism. Sketch out your landscape ideas on paper: how the trench is aligned on the battlefield, artillery, positioning of soldiers, and any other details that help to display the battle you want to recreate. Refer to WWI maps and background history on the battle scene you’d like to depict for adding the proper details. All scale models, soldiers and other modeling supplies are available at hobby shops and online. Cut out the bottom of empty cereal boxes to use as trenches, keeping in mind that one-inch depth inside the cereal box represents about a yard. 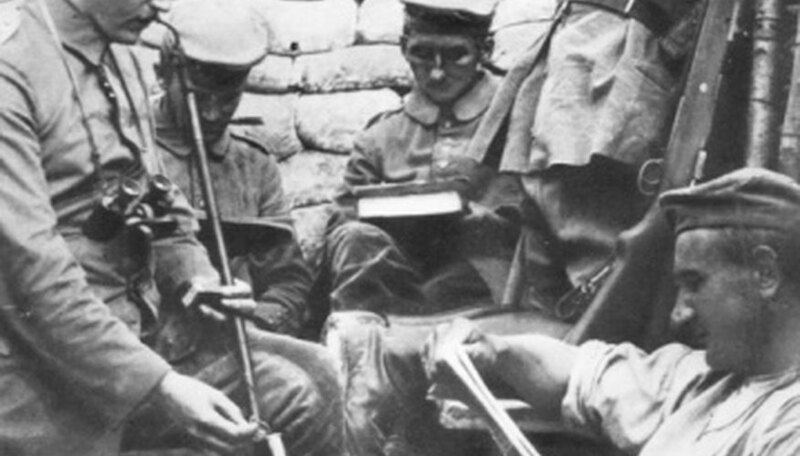 WWI trenches were up to 12-feet deep or more. Refer to your plans and glue the trench to a wooden base. Cut out strips of cardboard from the remaining cereal boxes and use them to build up the landscape. Bear in mind that the top of the cereal box is ground level, so the cardboard strips are used as a framework for elevating the ground. Glue one end of the cardboard strip to the trench and the other to the wooden base. Once you have built the ground up to the level of the trench, fill in the space underneath the cardboard strips with wads of newspaper to add support. Add flour to water to make papier mache paste. Continue adding flour until the mixture reaches the consistency of milk. Dip strips of newspaper into the paste and cover the entire model with papier mache, including the sides and bottom of the trench. Let the landscape model dry for 24 hours. Paint the landscape according to your plans, including roads, grass and craters left over from exploding artillery fire. Glue down actual pebbles, small rocks and twigs to decorate your landscape. Broken sticks can be fashioned to look like trees destroyed by artillery shells. Wrap copper wire around a 1-inch tube to make rolling barbed wire entanglements. Complete the diorama by gluing artillery and soldiers to the landscape. Barry Index lives in Los Angeles where he has been writing about writing since 1998. Recent freelance activities have brought his work to wider audiences through FictionAnitdote.com and several other writer-enthusiast sites. He received his Bachelor of Arts degree in English from California State University, Northridge.